To celebrate New Museum’s 40th anniversary (contemporary art museums, they grow up so fast! ), two new gallery spaces and several exhibits will be added this fall. The temporary galleries will open on September 27 and showcase work by Peter Halilaj and filmmaker Khalil Joseph. The galleries will connect the museum’s ground floor to 231 Bowery, which the museum purchased in 2011, and will operate for an indefinite period of time, according to a museum spokesperson. As he introduced the new Raymond Pettibon retrospective, New Museum artistic director Massimiliano Gioni admitted that he first became aware of the artist via his album covers for the Minutemen, Black Flag, and Sonic Youth. While we’re in confession mode: I still think of Pettibon mainly as the brother of Black Flag frontman Greg Ginn and the creator of the punk band’s iconic logo. But “A Pen of All Work,” which opens today, is further proof that the artist is far more than just a nihilistic doodler whose work has been “displayed” by skaters and punks sporting Six Pack t-shirts. Last Saturday, several groups of artists, scholars, entrepreneurs, writers, and more gathered in the basement of the New Museum for the second annual Open Score symposium, where they delved into topics like artificial intelligence, how memes relate to blackness, and ways the internet can create social infrastructures. The afternoon was co-presented by Rhizome, a contemporary arts organization centered on intersections of art and technology. 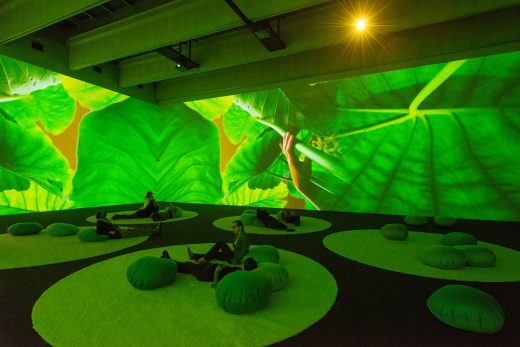 Pipilotti Rist, Gnade Donau Gnade (Mercy Danube Mercy), 2013/15. It’s been two years since Raymond Pettibon’s surfer art went on display on the Upper East Side. Wait, wha? The artist who did the anarchic drawings that graced the cover of Black Flag albums and concert posters? On the Upper East Side? If that seemed weird, this makes more sense: downtown’s own New Museum has announced that, in February, it will put on the city’s first major museum survey of Pettibon’s work, featuring more than 700 drawings across three floors. At The New Museum, 235 Bowery, Lower East Side. 7pm. Tickets are $20 ($15 for members). More info here. Mysteriously odd artist and music producer SOPHIE (the brainchild of weirdo party jams BOOP and LEMONADE, among others) takes over the New Museum for a multidisciplinary evening exploring the notion of synthesis in art. First, there’ll be a panel discussion with artists Gerry Bibby, Travis Boyer, Hayden Dunham, experimental dance collaboration FlucT, Matthew Lutz-Kinoy, and Henrik Oleson. Following that, the artists will present live performance and original music. Prepare to have your brains stimulated, hear some really weird sounds, and maybe even dance a little. This exhibition is New York’s first gallery-wide exhibition of artists from the Arab world, and is appropriately (and devastatingly) dedicated to exploring the ethics of representation and the status of images as instruments of political consciousness. Bringing together 45 artists and collectives from over 15 countries, from North Africa to the Gulf, Here and Elsewhere presents a sweeping, riotous portrait of a heterogeneous region heretofore underrepresented in the NYC art world.